After our three days in St. Martin/Sint Maarten, we journeyed over to Anguilla for a wonderful seven-days on that island. For the first time in many summer trips, we’re talking about returning to our destination. If you are considering Anguilla, you should know a few things before you book. First, if you are looking for either a massive party spot or a bevy of activity, stay away. This place is for those that want to rest and rest hard. There is one golf course and some tennis courts, but the primary focus of tourists is eating, sleeping, and sunning at the beach/pool. Second, it ain’t cheap. You’ve probably already seen the hotel rates, but restaurants will get you for a minimum of $100 with drink. Our cheapest dinner was at Picante, the local Mexican spot, and that was $78 including tip, but without alcohol. So again, if you want a cheap, party spot, you won’t find it in Anguilla. 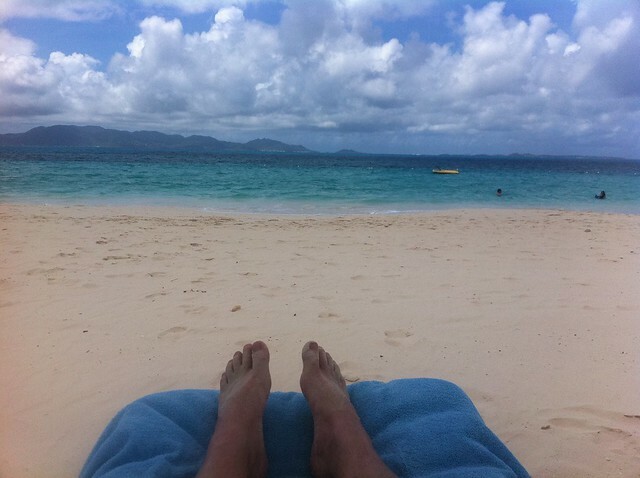 Disclaimers aside – we loved Anguilla. It was fabulous. We wanted rest, and we got rest. We took a ferry operated by GB Express to get from Sint Maarten to Anguilla. This was based on many of the comments over at Trip Advisor. We’re glad we took the recommendation. The public ferry that leaves from Marigot looked very hectic and crowded. GB Express boats seat maybe 12, and it is just a better operation. We made our reservations in advance and had no problems. (I should mention that we left our rental car at the dock in Sint Maarten, and Lesley from Kenny’s went there to pick it up.) I know there is a flight from SXM to AXA. It is about double the cost of the ferry and is all of 10 minutes. Maybe next time we’ll try that. On Anguilla, we rented a car for four of the days. This was well worth it. We got to explore the island a bit, but it also gave us flexibility. We didn’t have to worry about calling a taxi ahead of time. It was also exciting to drive on the left for the first time in my life. I was disappointed, however, to get a car with left-hand drive. Next time, I’ll ask for a right-hand drive car. We used Island Rentals, solely because the concierge at the hotel arranged it. We got another white Toyota Corolla, but in much better shape than the one on Sint Maarten. We stayed at the CuisinArt Resort in a Luxury Junior Suite. For those interested, we stayed in room 1007, which is the building farthest to the left, as you stand facing the beach from the lobby. We loved it. The resort is the perfect size for us, the service was generally good, and the amenities were great. It wasn’t perfect, and I’ll note below a few things that could be improved. We took a taxi from the Blowing Point Ferry Terminal to the hotel. It was $18 for that trip. We were met at the entrance by Stephane, the manager. He was somewhat ubiquitous at the resort, as was the #2 man, Fabio. Both were very pleasant and were helpful. As we checked in, we received our vouchers and our welcome drink. We were escorted to our room and the bags arrived shortly afterward. The video below showcases the room, so I won’t go into massive detail here. It was more than comfortable, and the view was just amazing. I’ve never stayed anywhere before with views like that. We never had trouble getting a seat at the beach or a seat at the pool. Attendants were omnipresent to “make-up” the chairs with towels and offer free bottles of cold water. There were also free floats for use in both the ocean and the pool. Each set of lounges, both at the beach and at the pool, came with a cooling umbrella. Mrs. Spidey and I commented multiple times about how nice it was not to have to get up at 6am to claim our chair. And to say that the beach was quiet is an understatement. 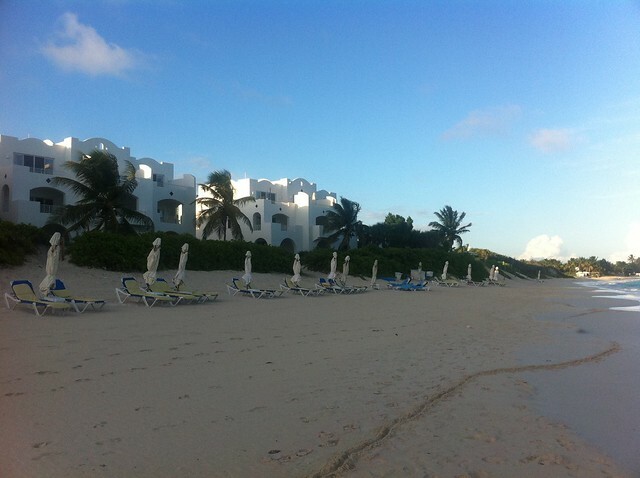 Although all beaches in Anguilla are public, there really wasn’t anyone else on the beach but CuisinArt guests. Well, there was Mike the bracelet guy who came by every morning, but that’s about it. It was just pure, utter relaxation. For some flavor of the grounds and the lobby, I shot two more videos below. I would be remiss, if I didn’t mention the Beach Bar and Sam the bartender. I would be further remiss, if I didn’t recommend the frozen mojitos that he makes with fresh, hydroponically grown mint. They are crazy good. I’d be even more remiss, if I didn’t tell everyone that there is happy hour from five to six where all of Sam’s drinks are two-for-one. The beach bar at the CuisinArt from 5pm to 6pm is about as crazy as that place gets. 1. Internet Access. I know we were on vacation, but we needed access to check email and see photos of our kids at camp. Internet in the room was wired and didn’t work for the last three days. WiFi was available only in the lobby and part of the pool. They have to get WiFi in the rooms. Stephane says they plan to do this in the next few months, when the hotel closes for hurricane season. 2. Coffee. Seriously. The in-room coffee maker was too upscale for us. It had these very small, individual demitasse coffee cups, and only the first two were free. At breakfast time, the only way to get coffee was by going to breakfast or ordering room service. Give us normal coffee makers and perhaps a few coffee urns in the lobby. That would be great. 3. Service oddities. We asked for several extra pillows upon check-in, which arrived right away. I sleep with two pillows under my knees for my back. I’ve done that for years. However, each morning, like clockwork, the extra pillows were moved to the closet up on top of an armoire. I then pulled them out each night. Turn down service was also nice, but we never used the slippers and never used the bathrobes on the bed. I’m just nitpicking here. We purchased the Sea of Love package from CuisinArt. This included three lunches at Mediterraneo, three dinners at Santorini’s, including the Chef’s Table, one-day car rental, a wine tasting, and a spa package. We’re undecided whether to do this again next year. I need to do the math. All-in-all, I can tell you that we ate way too much while in Anguilla. It was great food, but there was just so much. Mediterraneo is the restaurant where you eat breakfast, and it is then open for lunch. Breakfast was very, very acceptable. It was not spectacular. There is a buffet that includes many varieties of fruit, cereal, pastries, pancakes/waffles/French Toast, and some local salt fish, which I enjoyed. You can also order omelets. Coffee is European strong. That means stronger than Starbucks. Without a voucher, my guess is that lunch will easily set you back $50+ for two. That’s a lot, if you plan to eat lunch every day. We didn’t. We ate our three lunches and went without the other days. We just didn’t need it after a big breakfast and in anticipation of a large dinner. Lunch there was very good. We recommend several things. Salad is made to order by selecting what vegetables and dressing you want. They have the same for pasta and pizza. Mrs. Spidey had the salad each lunch and said it was very good. I had a pepperoni/sausage pizza one lunch, and it was quite good. We can also recommend the lobster curry, the cheeseburger, and the grilled lobster. With a voucher, you get appetizer, main course, and dessert, and, in reality, that was just too much food. We ate at Santorini’s three times, including the Chef’s Table. The Chef’s Table was $195 per person, which includes five courses, each paired with wine. We agreed that, had we not bought the package, we would not have paid for it. The food and wine were good but, again, it was too much. Notable was some fried calamari on saffron rice for the second course. I like the foie gras for the first course as well. I will write, however, that we were a bit disappointed by the Chef’s Table, as it really wasn’t a chef’s table. We were the only people who ate the meal that night, and we were not given a seat in the kitchen. In fact, the chef never came out to talk to us. We never asked why or insisted, but we should have. Our two other dinners at Santorini’s were ok. I’m not going to say they were the best ever. We each had grilled lobster once, which was very good. Again, with the voucher you got appetizer, main course, and dessert, and it was just too much food. I will say that I highly recommend the beef lasagna. It was outstanding. We had a bit of a service goof our last night there. We had an 8:00 reservation, but, when we arrived they did not have a table. We learned that they had seated too many walk-ups. After 20 minutes of waiting, we were given a seat inside (all others were on the veranda) and could see dirty dishes piling up. We were told we’d be moved as soon as a table became available, but then the first available table went to another group. We were eventually moved, and Fabio did wipe all charges for us. Nonetheless it was frustrating. We ate at three restaurants off-property. We had a drink and some small plates at Spice, which is at Cap Juluca. We had wanted to see what Cap Juluca looked like. Spice is in a building at the far end of the Cap Juluca resort, to the left as you look at the water. We sat at a table right overlooking the water, right where it lapped on some rocks. The restaurant web site just about shows where we sat. In the dark, however, there really wasn’t a view. Spice occupies the same building as a wine bar called Flights and the Pimms restaurant. Mrs. Spidey had some fried calamari, and I had something called tuna four-ways, which was outstanding. I also had a flight of red wine that was very good. A few nights later, we ate at Blanchards. I had read about Blanchards in the book “A Trip to the Beach,” written by Melinda Blanchard. The food there was very good, especially the corn chowder. We also had their famous Cracked Coconut dessert, which was better than anticipated. 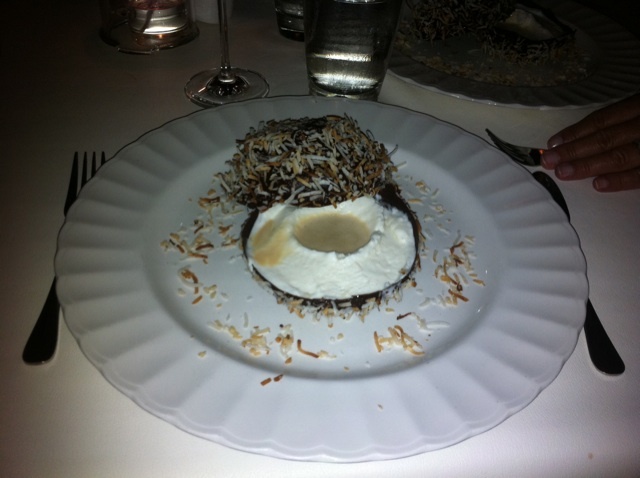 The Cracked Coconut is a chocolate shell with coconut ice cream and rum on the inside. It’s unreal. This time of year, Blanchards has a $49 price fixe meal, which we both took, although we paid extra for the dessert. When we got there, we surprised to see Samaro working there, as works at CuisinArt as well. Turns out that Blanchards is his primary job. Who knew? As noted above, we also ate at the lone Mexican restaurant on the island, Picante. Picante is located down on the end of the Island past Viceroy and past Cap Juluca. It seats perhaps 30 at small tables on a broad veranda. Mrs. Spidey had fish tacos, and I had chicken fajitas. They were both good. If you go, however, watch out for the hot sauce. Fortunately, I tasted a bit on the end of my knife before putting it on a fajita. It is H-O-T, hot. Our trip also overlapped (not intentionally) with the annual celebration of Anguilla’s emancipation at their Summer Festival. We avoided crowds by heading down to Sandy Ground on the Sunday before the August Monday celebration. On Sunday, we saw the beginnings of what we assume happened on Monday. We saw local sailboats lined up at anchor ready for a race. We saw some larger power boats lined up in a row (literal touching) forming a mini party cove. We also saw many food and drink tents being set up. The pictures of the wall-to-wall crowds expected on Monday kept us away, but it looked like the younger set was ready to have a good time. As I’ve told friends and co-workers about our trip, I’ve come to say that it’s the best trip we’ve taken since our honeymoon. It’s probably also the most expensive. However, it was worth it and, I think there is a good chance, once we figure out schedules, that we’ll go back again. I need this view again.